You can use your Android TV to stream TV shows and movies from services like Netflix and Amazon Prime Video, watch your locally-saved media via apps such as Kodi and Plex, and even stream games from your computer to your TV screen. However, your Android TV can also be used to browse the web. Unfortunately, no browser comes pre-installed on the stock version of the operating system. Which is the best browser for Android TV? Here are your best options. Many Android TV browsers do not work with your device’s remote. You’ll need to use a gaming controller or a smartphone app to operate and navigate around the app. We start, therefore, with Puffin TV Browser. This one does work with your Android TV’s basic remote, making it an excellent choice for all users. The Puffin TV Browser has a version that’s been specifically designed for Android TV boxes—it’s not just a repurposed mobile Android app. The specially-designed interface means Puffin is lightweight, fast, and easy-on-the-eye. Other features include QR codes for adding your favorite sites to the app and support for Adobe Flash as and when it’s needed. The browser’s servers are based in the US, meaning you will see the American version of sites. It’s odd that Chrome does not come pre-installed on the Android TV operating system. It is perhaps even stranger that there’s no dedicated Android TV version of the app and it is not available in the Android TV Play Store. However, those oddities do not preclude you from installing Chrome on your Android TV How to Install Google Chrome on Android TV in a Snap How to Install Google Chrome on Android TV in a Snap Getting Chrome for Android TV is easy. This article outlines where to download Chrome for AndroidTV and how to install it. Read More . You can install the app on your Android TV box using the web version of the Play Store. Some devices will even let you install the app using a voice command. Using Google Chrome on Android TV has both pros and cons. On the pro side, if you’re an existing Chrome user, you will have access to all your bookmarks, browsing history, and other synced content. One of the cons is that Chrome probably won’t work with your existing Android TV remote, which makes it a little more awkward to use than some other options. Firefox is another well-known desktop and mobile browser that you can sideload onto your Android TV device 3 Easy Ways to Access Sideloaded Apps on Android TV 3 Easy Ways to Access Sideloaded Apps on Android TV If you have sideloaded apps on your Android TV, you need a good way to access them. Read More . Like Chrome, there is no dedicated Android TV version of Firefox. The lack of its presence on the Android TV Play Store is due to Google’s restrictive requirements on what qualifies as an Android TV app. People who use Firefox on Android TV often point to its extensions as one of the app’s core benefits. Unlike Google Chrome, almost all your extensions will work on the Android TV platform. Anecdotally, lots of users also say that browsing YouTube is faster when using Firefox than when using the official YouTube app. You may not experience the same results. Remember, you can easily manage Firefox or any other sideloaded apps on your Android TV, so don’t let the sideloading aspect put you off. TVWeb Browser is more in the mold of Puffin TV Browser. It’s a web browser that’s specifically designed to run on the Android TV operating system. Navigation is simple. On the left-hand side of the screen, you have access to your favorite search engines, your bookmarks, and the settings menu, and that’s all there is to it. 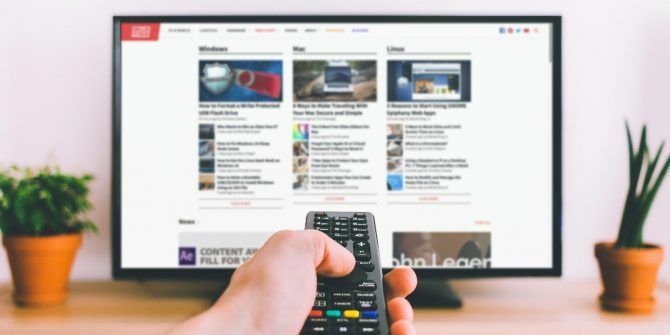 In terms of features, TVWeb Browser offers integrated voice search, bookmarks, access to your browsing history, User Agent switching, customizable search engines, and an on-screen mouse pointer that you can control with your regular Android TV remote. TVWeb Browser is free to download and use. The unimaginatively-named Web Browser for Android TV is another Android TV browser worth considering. We don’t think navigation is as smooth as what you’ll experience in the Puffin TV Browser or TVWeb Browser, but at least it’s another viable option if your only means of control is the standard remote. Some of Web Browser for Android TV’s features include support for HTML5 full-screen videos and customizable bookmarks. If none of the browsers we have looked at are sufficient enough to meet your needs, there are a couple of alternatives available to you. If you own an Nvidia Shield (and you should, as the Nvidia Shield is one of the best boxes for cord cutters 7 Reasons the Nvidia Shield Is the Ultimate Device for Cord-Cutters 7 Reasons the Nvidia Shield Is the Ultimate Device for Cord-Cutters The Nvidia Shield may just be the ultimate device for cord-cutters everywhere. Here are seven reasons why it beats the competition without much effort. Read More ), you can use the device’s GameStream feature to access your Windows desktop and thus use any desktop browser you choose. The process is possible because GameStream lets you manually add any game through the GeForce Experience app on your PC. If you add C:\Windows\System32\mstsc.exe (the Remote Desktop Connection app) you can be looking at your computer’s desktop in seconds. Of course, you will need to use your Android TV remote as the mouse, which could be tedious. If your Android TV box supports it, you could use a Bluetooth-enabled mouse instead. 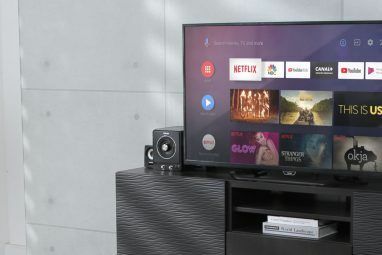 Android TV boxes come with built-in Chromecast technology. As such, you can use Chromecast to cast your computer screen to your TV, again allowing you to use any desktop browser you’ve installed. The downside of using Chromecast to access a browser on Android TV is the lag. It will not be a suitable solution for some tasks, but it’s more than adequate for streaming video and listening to audio. Which Is the Best Android TV Browser? After looking at various options, and weighing up the pros and cons, we like Puffin TV Browser the most. It’s clean, fast, and offers the right balance between features and usability. 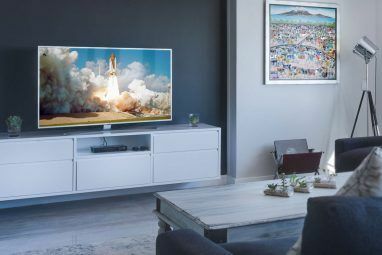 And if you would like to learn more about the Android TV, be sure to check out our articles looking at the best Android TV launchers The 7 Best Android TV Launcher Apps The 7 Best Android TV Launcher Apps It's easy to replace the Android TV launcher! Here are the best Android TV launcher apps you should consider using. 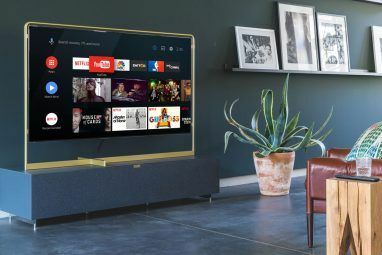 Read More and the best Android TV apps to sideload 7 Essential Android TV Apps Only Available via Sideloading 7 Essential Android TV Apps Only Available via Sideloading Not all Android apps are available on Android TV. However, there are some essential Android TV apps worth sideloading instead. Read More .